ABRAHAM LINCOLN. 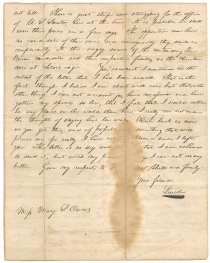 Autograph Letter Signed, to Mary S. Owens, December 13, 1836, 2 pp., 9¾ x 7¾ in. I have been sick ever since my arrival here, or I should have written sooner. It is but little difference, however, as I have verry little even yet to write. And more, the longer I can avoid the mortification of looking in the Post Office for your letter and not finding it, the better. You see I am mad about that old letter yet. I dont like verry well to risk you again. I’ll try you once more anyhow. The new State House is not yet finished, and consequently the legislature is doing little or nothing. The Governor delivered an inflamitory political message, and it is expected there will be some sparring between the parties about it as soon as the two Houses get to business. Taylor delivered up his petitions for the New County to one of our members this morning. I am told that he despairs of its success on account of all the members from Morgan County opposing it. There are names enough on the petitions, I think to justify the members from our county in going for it; but if the members from Morgan oppose it, which they say they will, the chance will be bad. Our chance to take the seat of Government to Springfield is better than I expected. An Internal Improvement Convention was held here since we met, which recommended a loan of several millions of dollars on the faith of the state to construct Rail Roads. Some of the legislature are for it and some against it; which has the majority I can <2> not tell. There is great strife and struggling for the office of U.S. Senator here at this time. It is probable we shall ease their pains in a few days. The opposition men have no candidate of their own, and consequently they smile as complacently at the angry snarls of the contending Van Buren candidates and their respective friends, as the Christian does at Satan’s rage. You recollect I mentioned in the outset of this letter that I had been unwell. That is the fact, though I belive I am about well now; but that, with other things I can not account for, have conspired and have gotten my spirits so low, that I feel that I would rather be any place in the world than here. I really can not endure the thought of staying here ten weeks. Write back as soon as you get this, and if possible say something that will please me, for really I have not been pleased since I left you. This letter is so dry and stupid that I am ashamed to send it, but with my present feelings I can not do any better. Give my respects to Mr & Mrs Abell and family. Only three letters from Lincoln’s courtship to Owens are known, all from 1836-1837 when she lived with her sister in New Salem. Lincoln wrote this first letter from Vandalia, and the other two from Springfield, in May and August of 1837. 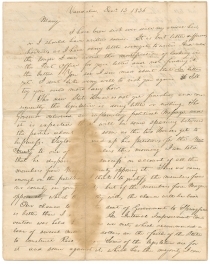 This is the only known Lincoln letter to Owens in private hands. The other two are in the Gilder Lehrman Collection on deposit at the New-York Historical Society (acquired at Christie’s at the Malcolm Forbes auction in 2002 for $779,500) and in the Library of Congress. After successfully taking a flatboat of cargo to New Orleans for local entrepreneur Denton Offutt, in the spring of 1831, twenty-two-year-old Abraham Lincoln returned to the small village of New Salem in northwestern Sangamon County to settle in the summer. He voted in his first election on August 1 and became a clerk in Offutt’s store soon thereafter. Later that year, he began writing legal documents for friends in New Salem. The following Spring, he became a candidate for the Illinois General Assembly. The Black Hawk War intervened, and from April to July 1832, Lincoln served three separate enlistments in northern Illinois. Although never engaged in battle, Lincoln, to his surprise and delight, was elected captain of his company by his friends and neighbors. More than a quarter century later, he reflected that this election was “a success which gave me more pleasure than any I have had since.” After his company was discharged, he twice reenlisted as a private in other companies. Returning to New Salem, he lost his first bid for the legislature on August 6, but he did do well in his home precinct. Early in 1833, he and William F. Berry purchased a store in New Salem, and a few months later, he also became postmaster, a position he held for three years. That same year, Mary Owens came from Kentucky to visit her sister Elizabeth Abell, who lived with her husband and children near New Salem. Lincoln, a frequent visitor to the Abells, met Owens at this time. By early 1834, Lincoln was working as a deputy surveyor, and he again campaigned for election to the General Assembly. He won one of the four seats in the Illinois House of Representatives for Sangamon County, and he took office in December 1834 in the state capital at Vandalia. As a freshman representative, he largely followed the lead of fellow Whig representative from Sangamon County, John T. Stuart, who encouraged him to study law. After spending the winter of 1834-1835 in the legislature in Vandalia, Lincoln returned to New Salem and his varied jobs of storekeeper, postmaster, and surveyor. He also developed a friendship or perhaps a romance with Ann Rutledge, the local tavern-keeper’s daughter. When she died of typhoid fever in August 1835, Lincoln was severely depressed. He returned to Vandalia for the second session of his first term during the winter of 1835-1836. In the spring of 1836, he began the process of obtaining a license to practice law. After campaigning in the summer, he won reelection to the Illinois House of Representatives on August 1, and gained admission to the bar on September 9. He tried his first case in October. He began his second term in the legislature on December 5, 1836, just a week before writing Mary Owens, who was again visiting her sister near New Salem. Among the new legislators in this session was Stephen A. Douglass (1813-1861), representing Morgan County. Douglass, who later dropped the second “s” from his name, would be Lincoln’s rival for the next twenty-five years. While Lincoln served four terms in the Illinois House of Representatives and one term in the U.S. House of Representatives, Douglas(s) served one term in the Illinois House of Representatives, as Illinois Secretary of State, as Associate Justice of the Illinois Supreme Court, two terms in the U.S. House of Representatives, and three terms in the U.S. Senate. In 1856, Lincoln looked back on his and his rival’s careers and reflected sourly, “Twenty-two years ago Judge Douglas and I first became acquainted. We were both young then; he a trifle younger than I. Even then, we were both ambitious; I, perhaps, quite as much so as he. With me, the race of ambition has been a failure—a flat failure; with him it has been one of splendid success.” Lincoln went on to lose to Douglas in the Senatorial campaign of 1858, where Republican candidates won the majority of votes, but the state legislature, still controlled by the Democrats, selected Douglas over Lincoln. Two years later, aided by the national attention brought to him by his debates with Douglas and by a divided Democratic party, Lincoln triumphed over Douglas for the Presidency in 1860. This 1836-1837 session of the Illinois General Assembly was an important one, as the legislators approved a broad system of internal improvements for the state, voted to move the capital from Vandalia to Springfield, elected a U.S. Senator, and incorporated the city of Chicago. Near the end of the session, in March 1837, Lincoln and fellow legislator Dan Stone entered their protest against slavery—and abolitionism—in the Illinois House of Representatives. Lincoln’s letter to Rushville lawyer William A. Minshall in December 1837, is perhaps most like this letter among Lincoln’s early productions. Written from Springfield, Lincoln asked about the political prospects of his law partner John T. Stuart in his campaign for a seat in Congress. “We have adopted it as part of our policy here,” Lincoln wrote, “to never speak of Douglass at all. Isn’t that the best mode of treating so small a matter?” Stuart went on to defeat Douglass very narrowly in August 1838 for a seat in the U.S. House of Representatives. After returning from the legislature, Lincoln moved to Springfield and became John T. Stuart’s junior law partner in April. From Springfield, he wrote two more letters to Mary Owens, in May and August, the latter of which seems to have brought an end to their awkward relationship. Mary S. Owens (1808-1877), was born in Green County, Kentucky, to a wealthy planter. She attended boarding school at Nazareth Academy, a Catholic school that accepted Protestants. She first visited New Salem, Illinois, in 1833 to visit her sister, Elizabeth Abell. Lincoln was apparently impressed when they met. Mrs. Abell agreed to invite Mary back to New Salem, but only if Lincoln would agree to marry her. It is not certain whether Lincoln agreed seriously or in jest. Nevertheless, Mary Owens returned to New Salem in 1836 and lived there until 1838, during which time Lincoln moved to Springfield. Despite coming to some sort of understanding concerning marriage, Lincoln was awkward and uncomfortable in the presence of women his age (both he and Mary were 24 years old), and unsure of his romantic feelings toward Mary and her intentions toward him. The relationship soon showed signs of strain. She returned to Kentucky in April 1838, and married Jesse Vineyard in 1841. They moved to Platte County, Missouri, where he and his brother founded Pleasant Ridge College in the 1850s. Jesse Vineyard died during the Civil War, and their sons fought for the Confederacy. 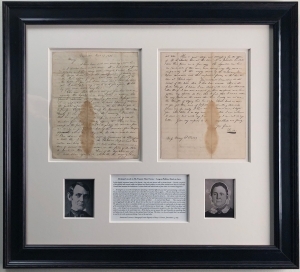 During the eight months between this letter and Lincoln’s last known letter to Mary Owens dated August 16, 1837, the relationship deteriorated. Mary, perhaps frustrated by Lincoln’s emotional confusion towards her, appears to have demanded a commitment on Lincoln’s part. In his next and last known letter to Mary, the unsure Lincoln offers an agonizing soliloquy regarding his feelings. At times appearing to speak more to himself than to Mary, he vacillates between making a commitment to marriage and breaking off the relationship entirely. Mary ultimately rejected Lincoln’s half-hearted offer to go ahead with their intended marriage.